As the whole Mists of Pandaria expansion cycle has been building towards a huge conflict between the Alliance and the Horde, the new raid in Patch 5.4 should come as no surprise to anyone. The newest raid is the Siege of Orgrimmar and is the last major raid content release for the Mists of Pandaria expansion. This guide covers the third section of the Siege or Orgrimmar LFR and the three bosses you will encounter in it. The bosses found here are Malkorok, the Spoils of Pandaria, and Thok the Bloodthirsty. This guide is meant for LFR players, as it covers the most critical elements of the LFR version of each encounter. The full versions of these fights are more complicated and demanding and while this guide will provide a basic understanding, to defeat these encounters in normal mode you will require more in depth knowledge than provided here. Malkorok is a trusted lieutenant in the Horde, that has led many of the Hordes endeavours in the Pandaren expansion. He was also the first to volunteer when Garrosh asked for someone to infuse with the power of Y'Shaarj. He has now become a power infused monstrosity that you must deal with. The fight alternates between two different phases, in one phase you need to deal with a lack of healing and in the other you need to deal with a crazed boss. During this phase there is an Ancient Miasma that fills the room. While active players are not healed, but instead a protective barrier is built up around them that absorbs damage equal to the healing that would have been done, capped at their max health. In addition all players are dealt shadow damage over time, meaning all players will need some pre-emptive healing to build up an absorb shield before they take the damage. Also in this phase there will be orbs of corruption that form. These orbs last until the end of the fight or until contacted. Once contacted they remove the pre-healing on a player and then inflict large amounts of damage, which means each player will likely only be able to clear one in each phase 1. If any of the orbs touch the boss, they will heal him for 5% of his health and grand him 5 rage. Malkorok has several AOE based abilities which include a frontal cone AOE called Arcing Smash, a melee range AOE called Seismic Slam which throws players in the air and forms ooze on the ground which slows players and explodes later when he uses Breath of Y'Shaarj, and he can rip open energy tears which deal shadow damage to anyone nearby. All of these need to be avoided as much as possible, as many can kill a player instantly, especially once he has a few stacks of Relentless Assault (described below). Malkorok also has an attack called Fatal Strike which will require a tank swap. It hits the player for huge damage but also boosts all damage to that target by 35% for 30 seconds. Over time in phase 1 Malkorok gains rage, when he reaches 100 rage he absorbs the Ancient Miasma and phase 2 starts. While Malkorok has absorbed the miasma he will deal massive damage to everyone in his frontal arc with his Blood Rage attack. The damage is over 3 million, but is split between everyone there. This means players need to group up in front of him so that everyone survives. He will lose 5 rage per second while in this phase so you need to survive 20 seconds. While enraged Malkorok also hits players with Displaced Energy which deals shadow damage over time for 9 seconds and then explodes for additional damage to everyone within 8 yards. This means that even though you need to stay grouped for Blood Rage, you need to clear out it you are hit with this attack. When Malkorok runs out of rage he will gain a stack of Relentless Assault which boosts his damage by 35% for the rest of the fight. This will stack, forming a soft enrage timer. This is in addition to his hard enrage timer of 12 minutes. /raid Pre-heal players in phase 1, and everyone needs to avoid AOE. Tank swap on Fatal Strike. Stack in phase 2, run if you get Displaced Energy. This second fight is against the combined artifacts that Garrosh has collected in Pandaria. Here you must defeat a large number of collected artifacts that have come to life as animated entities as well as the spirits that they have releases. You will need to deactivate the defense system in the area by turning off four separate switches one in each of four rooms. However to actually turn of the switches you need to open crates of artifacts and then defeat them to release their titan energy, once you have enough released you will be able to deactivate the security system in that room. There are several different types of crates that can be opened and each has something different in them that needs to be dealt with. There are also two different types of crates, based on if you are in the 2 mantid rooms or the 2 Mogu rooms. Either way you will need to defeat enough enemies to gather 100 titan energy in about 5 minutes or the defense system will kill you. Once one rooms switch it turned off another activates. The fight starts with two rooms active, meaning you will need to split up the raid. These crates let out monstrous creatures that are difficult and time consuming to defeat, however they release a large amount of titan energy once you do. Kun-Da - This enemy smashes the ground for huge AEO damage to everyone nearby. Jun-Wei - Has an AOE shadow attach that hits everyone near him. Shao-Tien Elder Council - Drains life from players and creates stone statues that do AOE damage around them until destroyed, and gains a 5% stacking buff to damage for each statue alive. Zu Yin - Deals fire damage with melee and ranged attacks. Xiang-Lin - Has an AOE jade flame attack to all nearby players. Mantid Commander - Throws several bombs onto random players which explodes 30 seconds later. You can drop some of these off, but they will explode in an AOE where they land at the end of the 30 second timer. These crates have dangerous enemies, but not as bad as the massive crates. These enemies release a medium amount of titan energy. Anima Golem - Creates AOE teleport zones which shift players back and forth randomly, if no one is in a zone, then heavy AOE fire damage is done to everyone within 30 yards, so players need to accept being teleported randomly. He can also create healing zones that heal for 15% health every second, you must keep enemies out of these zones. Mogu Shadow Ritualist - Can torment random players dealing increasing shadow damage over time. If dispelled it jumps to a new target, which means you need to time the dispells so that you don't just make it jump repeatedly when you do not have to, it will disperse when the mogu is defeated. He can also create runes of power which last for 45 seconds and increase haste by 150%. Lastly he has a channeled attach that deals heavy arcane damage. Set'thik Wind Wielder - Has several wind based AOE attacks and can rally nearby allies and increase their damage by 65%. Zar'thik Amber Priest - Spawns mantid to aid him and can apply amber residue to his allies healing them massivley over short periods of time. These are the most common and smallest crates of enemies. The enemies contained inside are the smallest and least dangerous and therefore release the least titan energy when defeated. They can however be defeated by only a few players instead of the whole raid. Burial Urn - Creates a spark of life which deals AOE damage around it, and more AOE damage when defeated. Quilen Guardians - Has a stacking bleed attack caused by its bite. Amber Shard - Creates AOE amber pools that burn players in them. Sri'thik Bombarder - This mantid can charge random players dealing damage to everyone in its path as well as throwing explosives at players that deal physical damage. These crates do not release items that provide any titan energy, instead they have pandaren guardian spirits. If you defeat these spirits, players in the same quadrant of the warehouse will gain benefits that will help them in the fight. Ancient Brewmaster Spirit - Has an AOE Keg Toss which deals damage and slows players, and has an AOE breath of fire. When defeated tanks gain a chance for all attacks to summon a bolt of lighting that deals damage to all targets nearby and to stun them for a short time. This can happen once every 15 seconds. Nameless Windwalker Spirit - Charges random players dealing damage and stunning the target as well as leaving a path of fire that remains in his wake for 30 seconds. When defeated all DPS players gain a change to have attacjs deal fire damage in addition to their normal damage, this is on a 5 second cooldown and deals significant damage. Wise Mistweaver Spirit - Has an AOE crane kick that pulls players in and deals damage to them. Also any damage this spirit causes heals it by 150% of the damage caused, making it hard to deal with. When defeated all healers will gain a chance to create a healing wave any time they heal a target, up to once every 8 seconds. The healing wave will travel forward 40 yards healing all friendly targets and damaging all enemy targets. /raid Kill Spirits to gain abilities in each quadrant, fight enemies until switch can be thrown, throw all 4 switches before time runs out. 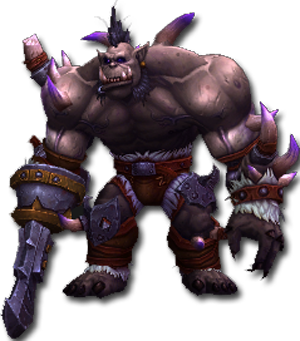 Thok comes from the Isle of Giants off the coast of Pandaria. There Garrosh's men captured several of the huge devilsaurs to train as beasts of war. However, this one particularly large and nasty devilsaur has proven to be un-tameable so far, and you now have to deal with him blocking your path. This fight is made up of two repeating phases, a normal phase and a frenzy phase. The frenzied phase occurs when Thok is brought to 80%, 55% and 30 % heath. Thok can bellow a Fearsome Roar which deals damage to everyone in his front arc and applies a stacking debuff that causes players to take 50% additional damage per stack. This requires Thok to be tanked facing away from the group and for tanks to swap when their stacks get too high. Thok gains energy throughout the fight, and whenever it reaches 100 he will let loose a Deafening Screech which deals high damage to everyone in the raid and interrupts casting. Each time he screeches he gains a buff that allows his energy to regen faster. Thok has several AOE damage effects as well. He has a Tail Lash that hits everyone in his rear arc for damage, and a Shock Blast that hits random players for lightning damage from his collar. 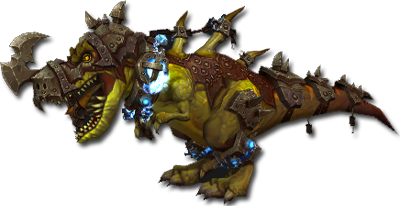 When Thok is dropped to 80%, 55%, and 30% health in LFR he will enter a frenzy. During this phase he will target and chase random players. He is not tankable and you must stay away from him if you are focused on or he will swallow you whole. During this phase a Kor'kron Jailer will spawn, which you have to defeat to free the prisoners that Garrosh has captured and placed nearby. Once the jailer is defeated and the prisoners freed, the fight will return to the standard phase 1. /raid DPS from sides, tanks swap at 2-3 Fearsome Roars, Run from Thok in frenzy phase if focused.